Featuring the brand new air rifle from Walther in Germany, the Walther Terrus, this is a full kit, with full power. This kit consists of the Walther Terrus in .22, a very well made break barrel spring air rifle, with an attractive synthetic polymer stock with beautiful engravings and markings within it. 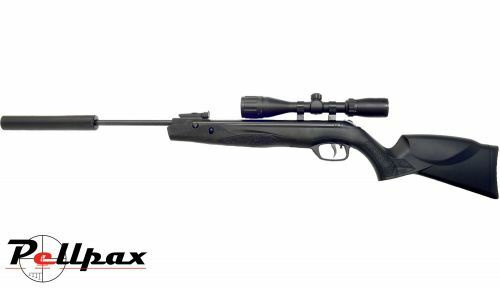 The stock is hard wearing and durable, ideal for beginner shooters as well as those who want a reliable, hard wearing air rifle. We are combining this great rifle with a super quiet Armex backdraft moderator, and a Hawke Vantage+ 3-9x40 scope and mounts. All this adds up to a great rifle combo, perfect for stealthy hunting in the field, or target shooting in the back garden! We are also including a padded gun bag, and a tin of pellets, everything you need to get going as soon as it is delivered. Add this item to your basket & spend an extra £170.01 to apply for finance.